A podcast about all things Macintosh. For Mac geeks, by Mac geeks. Show 117. Disney purchases Pixar. Intel announces 45nm chip success. Early Intel release slowing G5 sales. Old holes may make OS X vulnerable to hackers. Apple to open second London retail store. No “crossgrade” charge for Aperture. MacSpeedZone questions MacWorlds Core Duo Mac speed tests. Next Mac OS X update in the works. Next generation Finder may be in development. You’re not paranoid, your Mac is watching you. Is .Mac Homepage going extinct? More details on MacBook battery life. iWork and Microsoft Word compatibility. How to access the AIFF file in a Gragband 3 podcast project. More PowerBook issues, audio echos and stuttering. CPU Errata is common, not just an Intel Core Duo issue. New .Mac feature, access iDisk from your browser. Lots of feedback and support for Adobe Lightroom. Correction, The Loved Ones was the band on the last show, Jade Tree was their label. The iTunes music store has been updated with a bunch of new video content from MTV, Nickelodeon, Comedy Central, NBC and others like Channel N (???). Now you can get Dora the Explorer, Sponge Bob, Bevis and Butthead, South Park and more great 80s content like the A-Team. “I love it when a plan comes together”. There is a lot more there too. If you haven’t checked out the TV section in a while go over and see for yourself. It keeps getting better and better. A podcast about all things Macintosh. For Mac geeks, by Mac geeks. Show 116. iWork is the No. 2 Office suite in the US. Intel Macs, XP no, RedHat Linux maybe? Jobs reveals how to compete with the iPod. In the “real world” Intel Macs prove not quite as speedy. Intels new Core processors shipping with 34 errata. Apple launches PowerBook lower memory slot repair program. Amazon.com offering big rebates on new Mac products. Follow-up on OpenOSX WinTel 2.0 performance. Review of Apple photo management applications. Follow-up on issues with Nikon white balance in Aperture and Lightroom. Mixed reviews of Flip4Mac. Listener feedback on MacBook PCMCIA and Garmin GPS. iMac International pricing mystery solved? Apple “Solutions” expert reveals MacBook battery life? Most of the time if your Mac is broken it’s your fault. The “Mac Geek is listening to…” software. Mac switcher song now available for free download. Free Mac Mini car install PDF from MacFormat. Correction: I made an error with the name of the band featured on this episode. The band is called The Loved Ones, Jade Tree is the label. So how many of you are like me and have imported music into their iTunes library (while not connected to the Internet) and ended up with names like “Track 1”, “Track 2”, etc.? Personally, I am just too lazy to go track down the original CD and look on the back or in the liner notes to get the info. Now, I have a couple of those music loving friends who can name a track in an instant after hearing it, but they never seem to be around when I want to update the ID3 tags on my tunes, strange. Anyway, it turns out now I don’t need them thanks to an app called Tunatic. This app works just like your music loving, know-it-all friend. It listens to the track played from any source into your Macs mic, captures its musical “signature” and then goes out to an on-line database and returns the artist and song title information. It is pretty amazing. I wish it also had an option to just listen to the audio going to my Macs speaker, but because it uses the mic you have the advantage of letting listen to external audio sources like the radio or your TV. Think, playback the audio from that commercial on your TiVo that has the song you can’t seem to pinpoint. I tried it with several tracks played in iTunes into my iBooks built in mic and it returned the correct information every time. I am sure it will not always be 100% accurate, but for the convenience this app is staying in my iTunes utility belt. Update: Here is another app that does a similar function iEatBrainz. This one listens to the song playing directly from iTunes, no mic required. A podcast about all things Macintosh. For Mac geeks, by Mac geeks. Show 115. The great Mac boot debate, will Intel Macs boot Windows? Microsoft halts Media Player development for OS X. Hidden message tells hackers, “Don’t steal OS X”. Jobs email offers rebuttal to a 1997 Michael Dell statement. Mac Sales subdued in 4th Quarter, but profits still up. Apple yields to Mini Store pressure and adds warning. Apple/Sony BMG real a deal for iTunes Australia. Apple to only sell Pro apps as bundles. Apple opening second Canadian retail store. A bunch of post MacWorld tidbits. Issues subscribing to Photocasts from Windows and some tips to make it possible. How to move Podcast subscriptions between computers in iTunes. Review of Logitech Stereo USB Headset 250. Another OS X uninstaller, Yank. Video playback issues on 5G iPod after iPod 1.1 update. Question about the auto word completion “feature” in OS X solved. Remember to vote for the MacCast at Podcast Alley. New music, Treadmill by Carmichael. Pooh, for a bear of very little brain, you sure are a smart one. If you are old school and prefer the feel of rifling through your CD collection to browsing the Library in iTunes then this may be the App to help bridge your digital divide. CoverFlow is a beautifully designed media player that integrates with iTunes and allows you to visually select the tracks you want to hear. It’s hard to describe, but the website features a video that show it off well. 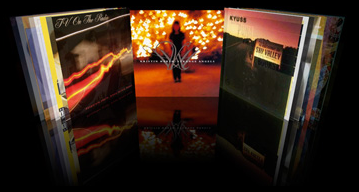 Basically think of it like filpping through a stack of CDs to find the music you want. I just looks freakin’ awesome. While the current version is just a “technology” preview, it worked great for me on my G4 iBook. It does require Tiger and at least a RAGE 128 graphics card, but beyond that it performs beautifully. This is really fun and shows off the power and creativity of the Mac well. I can’t wait to see the fully finished product. The other night I did another interview (seem to be doing a lot of these lately :) ). This time I talked with Rob over at Podcast 411. 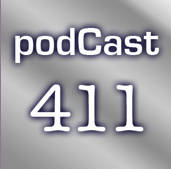 Podcast 411 is an interview show where Rob talks to all kinds of Podcasters. He does a great job and I was honored he selected me for an interview. We had a good time discussing the latest MacWorld announcements and other Mac stuff. We talked about how I started in Podcasting and the history and future of the MacCast among other things. I think many of you may find it interesting, so if you want to hear it just click the link below. Also, if you want to hear more great interviews with other pocasters be sure to visit Robs site and subscribe to his Podcast in iTunes. I was lucky enough to attend Macworld 2006 and, while there were a ton of cool new products and innovative software titles at the Expo, I was really excited to see the new, made for Mac, keyboard and laser mouse from Logitech. This killer combo was being displayed at just about every other booth. Looks like Logitech wanted to make sure you saw it over and over again. As for myself, being a two button mouse guy and the owner of a MX Duo, I am very glad to see this product finally hit the market. 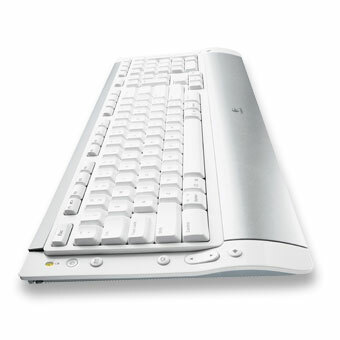 The Logitech system offers a look and feel that rivals that of Apples own mouse and keyboard. The keyboard has a soft textile feel to it and the mouse is laser which makes it more accurate than an optical mouse. The keyboard offers a Mac button layout which includes the eject button, volume controls and also a set programable buttons. Without a doubt this keyboard is, to me, the best you can get for your Mac. With an estimated price tag is approx $100 it’s a good value and this baby also boasts battery life of up to 6 months, which is awesome. The mouse also has a built in on/off switch for more energy savings. The Logitech S530 a must have for any two button Mac user.